This week we learned how to add and subtract rational expressions. These are a bit harder than multiplying and dividing because the denominator has to be the same throughout the expression. For example: where “x” cannot equal 0 or 4. For this expression, the least common denominator would be because neither denominator can be simplified any farther or multipled to create a common denominator, so we multiple the two denominators together to create one LCD. Since we’re multiplying the bottom, we also have to do the same to the top, so the equation becomes: . I chose this article because the royal wedding of Prince Harry and Meghan Markle is right around the corner, and i wanted more insight about the couple. The author writes in a very descriptive way, giving the reader facts and knowledge about past royal couples and the controversy with certain pairs based on race, religion, ethnicity, etc. I knew of Meghan Markle from the tv show she starred in, Suits, but was not made aware of her attachment to Prince Harry until the past year. The article addressed the past women of the royal family and how race, class, and marital status is becoming less important, replaced with wealth. The pairs love story will be receiving a tv movie called “Harry and Meghan”, which will follow their romantic journey over the years. This week we learned how to graph quadratic reciprocal functions, and learned some new vocabulary. When graphing the parabola, you first find the asymptotes, invariant points, and then the location of the hyperbola. 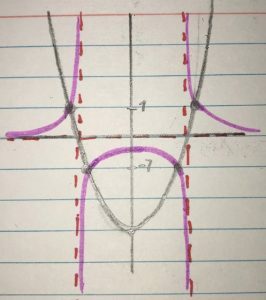 Asymptotes are located at where the parabola crosses the x-axis. At the x-intercept(s) you can drop a dotted line vertically, and a dotted line horizontally. 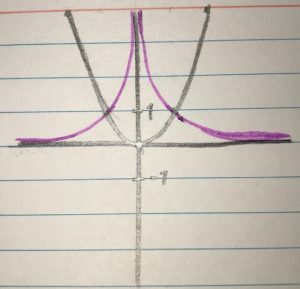 Depending on how many x-intercepts you have will dictate how many asymptotes you have. 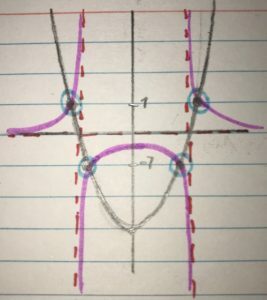 Invariant points are located where your parabola meets the points on the y-axis 1 and -1. 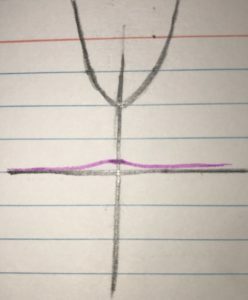 The parabola can have 0-4 invariant points. These dictate where you’ll draw the hyperbola. When you graph the hyperbola, there’s no need to graph each individual point. Instead, you can just draw a curved line going through your invariant point and approaching zero. This week we learned how to solve systems algebraically with more than one variable. In these types of systems you used steps. This may not make complete sense in steps, so I’ll demonstrate using the first example. next you plus your new equation x=4-6y into your second equation: 0=x-4y which turns into 0=(4-6y)-4y. This becomes y=2/5. While solving quadratic equations, it’s useful to take a look at the discriminant. if you have a quadratic equation (equation equal to zero with 3 distinct parts), you can use the quadratic formula to solve. Depending on the answer, we can figure out whether the equation will have 1,2 or 0 solutions. using this information we can plug in the numbers to our equation to find the discriminant. If is our equation, we just put our numbers we found in the spots of the letters, and simplify. using this we know that since the discriminant is -15, the original quadratic equation does not have any solutions, and using the quadratic formula would not work. I’m talking like that on purpose. Sorry if i offend anyone!